Whip cream: With electric mixer on medium-high speed, whip cream to stiff peaks, 2 to 3 minutes. Transfer whipped cream to small bowl and refrigerate. Beat eggs: Combine eggs, sugar, and water in large heatproof bowl set over medium saucepan filled with ½ inch barely simmering water (don’t let bowl touch water). With electric mixer on medium speed, beat until egg mixture is thickened and registers 160 degrees, 7 to 10 minutes. Remove bowl from heat and continue to beat egg mixture until fluffy and cooled to room temperature, about 8 minutes. Beat, fold, cool: Add chocolate and vanilla to cool egg mixture and beat until incorporated. Beat in butter, a few pieces at a time, until well combined. Using spatula, fold in whipped cream until no streaks of white remain. Scrape filling into pie shell and refrigerate until set, at least 3 hours and up to 24 hours. Serve. NOTE: You will need a fully baked pie shell for this recipe. Use your favorite pie dough or a pre-made refrigerated or frozen crust. I just wanted to vouch that this pie is so good!!!!!!!!!!!!!!!!! I was skeptical about how good the crust could be (I did use a homemade one, but I was reminiscing about chocolate cream pie's oreo crust), but boy was I wrong! We love the Chocolate Cream Pie from the America's Test Kitchen Family Cookbook with that wonderful oreo crust (!!! ), but we actually tried both recipes side by side last night, and my husband and I both preferred this one! Considering how good their chocolate cream pie recipe is, that's saying a LOT!!! 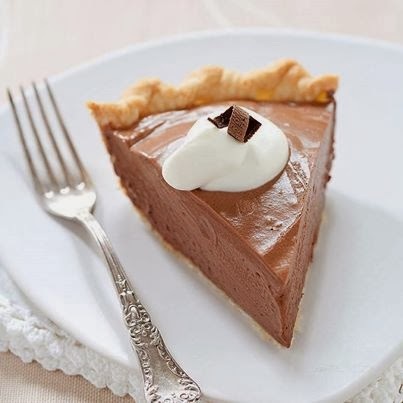 What an amazing texture, SO good with the pie crust, and so chocolately. This is a truly amazing pie! I still highly recommend them both, really. Yum!!!!!!!!!!! !